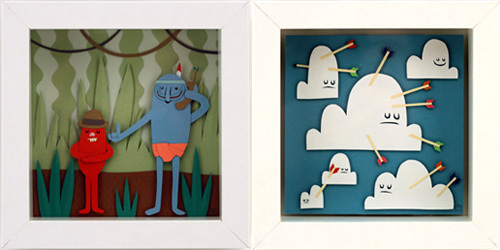 Cut paper works always make me smile, weather they are complex and serious or sleek and humorous. The work of Jared Andrew Schoor falls into both categories. 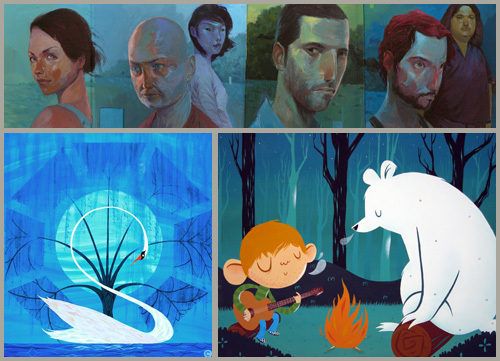 He currently is part of a two man exhibition of work at Gallery Nucleus (which I still wish was in New York) along with Sean Chao. Jared’s work just really made me smile this morning and got me excited about creating this week. I only hope someone really does shoot these clouds with arrows so maybe the sun will come out! I hope everyone has a safe and happy weekend. We have about 2 feet of snow in Brooklyn and it’s still falling. This morning we took einsetin through the park and as he bounded through the snowbanks it reminded me how snow days felt as a child. That extra special day where you didnt have to go to school and instead made snowmen with the neighbors and trolloped through the woods looking at animal tracks in the white powder. In brooklyn it’s a little diffrent I think this print by Lauren Castillo gets it just right. An amazing street artist going by ‘Slinkachu’ installed these little hand-painted figurines in strategic locations throughout different cities and then photographed them. He left these miniature installations out to fend for themselves. Do you think you would notice these little guys while you were out for a stroll in the urban landscapes. I probably would because I tend to look at my feet a lot. 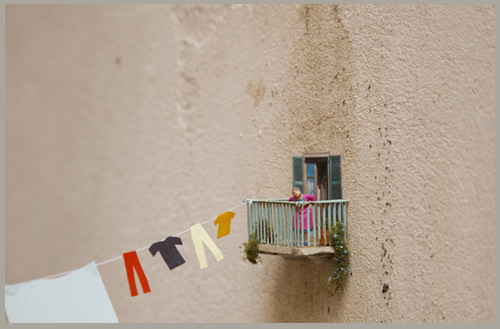 Check out the little people blog to see these installations close up and far away, just as you would see them walking by. If you’ve been dreaming of having one of Audrey’s beauties to hang on your walls you only have to wait until saturday. 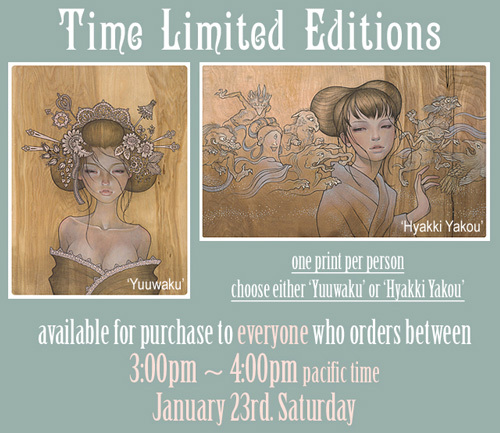 She is going to release another two art prints with her “time limited edition” method. 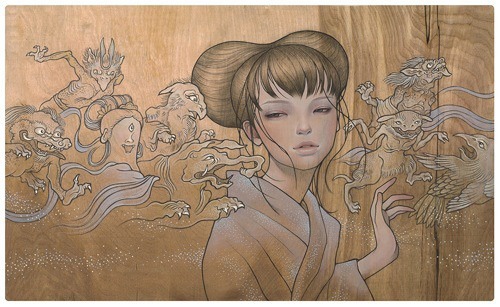 “Yuuwaku” is a 16″ x 20.5″ giclee, while “Hyakki Yakou” is a 14″ x 23″ giclee. The unframed prints are priced at $100 each, with a framed option available. The catch is these beauties will only be available Saturday, January 23 from 3pm-4pm (PST.) The edition size will be determined by how many orders are placed. You can only order one piece so choose wisely. One of the things I am really looking forward to in 2010 is the final season of LOST. So many questions. What’s the deal with the four toed statue? What’s up with Libby? Where the heck is Claire? So little answers. I’m hoping that many of these will be answered in the last season, even though I’m sad to see this show go, I’m ready for closure. Gallery 1988 in California recently hosted a Lost inspired show, filled to the brim with some amazing pieces. from some very talented artists. For those who were lucky enough to attend the opening of the show Damon Lindelof and Carlton Cuse were also in attendance. 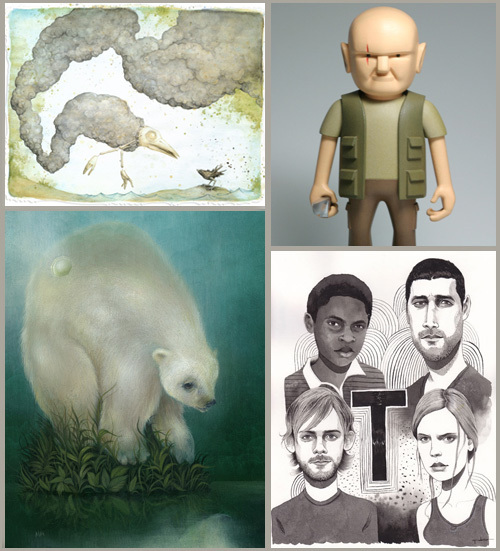 I’ve picked out a few of my favorite pieces and recommend checking out the rest of the show here. Hanukkah is here and Christmas is just around the corner. 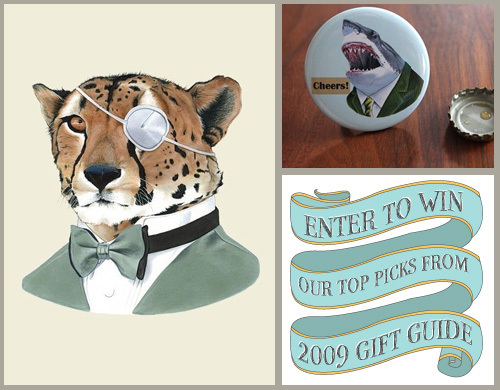 I hope you have had some time to check out our Handmade Holiday Gift Guide for 2009. So many great picks and amazing artists. We have picked some of our favorites that you can actually enter to win this year. You know so you can get some great goodies for yourself in the new year. 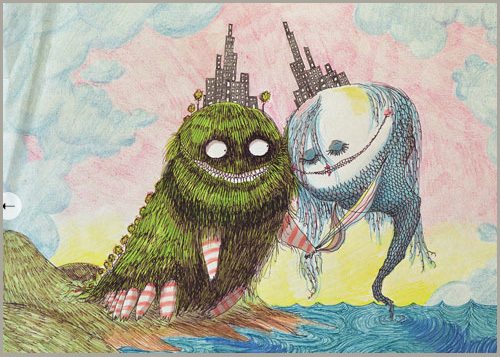 We actually have a last minute donation from Ryan and Lucy of Berkley Illustration. They have been so kind to donate a print and an awesome bottle opener as well. So get your name in, twitter to your friends for an extra entry and keep your fingers crossed. Happy Holidays! 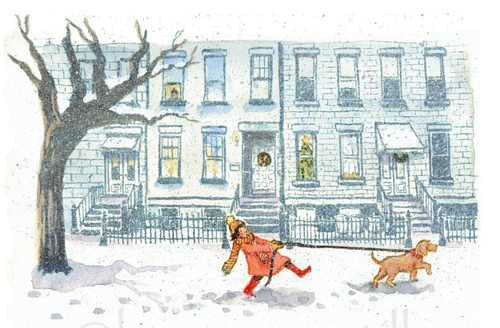 I love the illustrations by Michelle Cavigliano and her shop My Zoetrope. I had the opportunity of seeing some of her work up close and personal at Bust this last weekend. I really lover her mini art and think it would look great on a mini art wall or even just hanging on a tree. She has some amazing work out there that always seems to make ms smile. If you love original art and amazing movies than you have to check out this amazing charity auction. 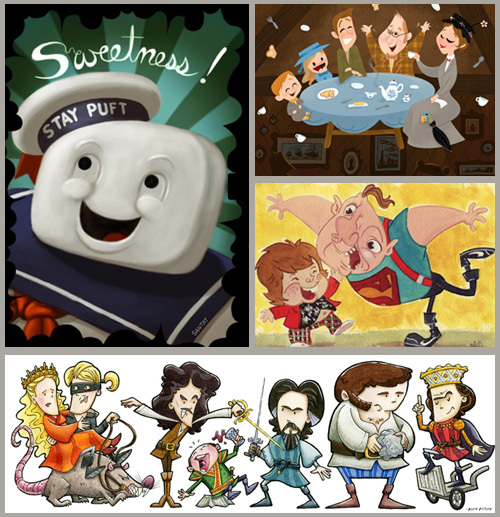 Hey You Guys is the second annual charity auction featuring the work of over 30 artists all themed with some of the best movies from the 80’s. The profits from the auctioned pieces are donated to DonorsChoose.org which supports classroom donations for needy schools. I picked out a few of my favorites from the acution below. So bid online for your favorite to spice up theat blank wall in your home until December 13th. 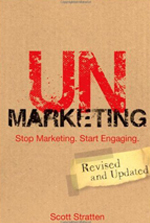 Direct mail is alive and well. Just ask the MOMA (museum of modern art in nyc). They have $75 more from me than they had last week because of the envelope that arrived at my apartment this week. I’ve know for quite a while about the upcoming Tim Burton retrospective the museum has scheduled this month but hadn’t given much thought on when I would get a chance to check it out. Well inside this little marketing gem from the museum was the opportunity to view the exhibit before its official opening date this Sunday, simply by becoming a member of the museum. SOLD! So tonight Matt and I will be checking out the exhibit for the first (and certainly not last) time. The exhibit is on view until April, so there is plenty of time to check it out. I’m very happy to be a supporting member of the MOMA.